Vintage Style Wedding Dresses The Retro Look Is Back! Vintage style wedding dresses are what you should be looking for if you are having a art deco wedding theme. The popularity of the show "Downton Abbey" has made vintage styling more sought after by brides these days. Vintage style wedding gowns, also are the rage right now for rustic, country theme weddings. Brides who want vintage styling are looking to feature designs from the past. Beginning with the dress to the invitations, they carry this theme throughout their wedding planning. Which decades are considered for vintage bridal gowns? This would be wedding gown styles popular during a specific decade in the 20th century between the 1920's and 1980's. Some popular time eras for vintage bridal dresses right now are the 1920's and 1930's because of Downton Abbey. But the 1950's and 1960's also continue to be popular. Tea length and short wedding dresses were popular during certain decades in the past and are again back in vogue. Adorn these dresses with the right accessories for a vintage look. So which decade are you going to choose for your vintage wedding dress? Are you looking for a "Hollywood Glam" look from the by gone days? Are you the type that like the soft, feminine look of gowns made with flowy fabrics, laces, ruffles, pleated tulles, embroidered nets and fabric flower adornments from the 1920's or 1930's? Then if this sounds like you, a vintage style wedding gown is right for you? 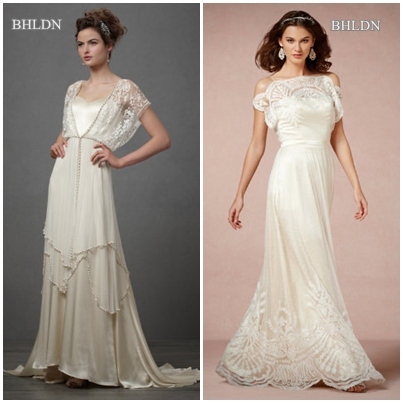 The gowns above are vintage style wedding dresses that are modeled from the 1920's and 1930's era. If you don't want to look too authentic...this wedding dress has a modern and vintage wedding dress styling to it. You have a little of modern with a little mix of the by gone days. Vintage styled wedding dresses are gowns that are designed to look like the styles of the past. Also, there are designers who like to mix the old with the new in the modern wedding dress styles. There are some changes and simple additions that can be added to your wedding dress to add vintage styling to it. What are they? Add a belting of satin fabric or ribbon to the gown. Adorn with fabric, ribbon or silk flowers. Embellish with gems of crystals, pearls or feathers. You can also opt to wear a jacket or shrug that has the styling of the period of time you like. Certain styles of headpieces were worn during specific decades. The birdcage veil is a style from the past, that has resurfaced. Pillbox hats were the rage of the 60's. In the 1920's veils that lay flat on the head edged with lace and attached to flat headbands, are the rage right now. Wearing jewelry that identifies with a certain decade will also add that vintage flair. Pearls were really a standard of the 50's and 60's. Gloves are one accessory that comes and goes. The wrist length crochet style gloves definitely have that vintage look. The wrist and long elbow length satin gloves were popular during the 1960's. Gloves are important for that "Hollywood Glam" look. A lace wedding dress is one that you can adapt into vintage style wedding dress by adding some of the elements mentioned above!